Last summer when I was just visiting China and no idea I would ever actually live here, I took pictures and made notes of my favorite foods. Some dishes I just had to learn how to make on my own. That’s exactly how I felt about this noodle dish. It’s like a Chinese pasta salad. Cold, refreshing, and spicy all at the same time. It is easily one of my favorite dishes here and Jesse can’t get enough of it either. Lucky for me I have some pretty great local Chinese friends. Almost exactly a year ago I posted about our friend Mandy teaching us to make dumplings, now she has taught me how to make these cold noodles. My 24×24 party was the first time I made them on my own. I have to admit, I was a little nervous making it on my own for a group of Chinese food experts, but this dish was the hit of the party and disappeared in the blink of an eye. *Noodles can be found in the Asian aisle of your grocery store, may also be labeled Rice Noodles. 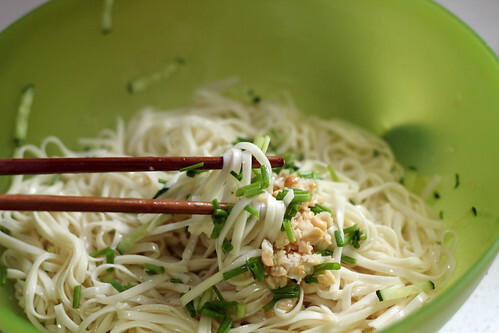 Thin, spaghetti like, noodles are best, but thicker noodles, like in the photo, also work. My noodles came in a roll and I used 1/2 of the roll, which I guess to be about 12 oz. 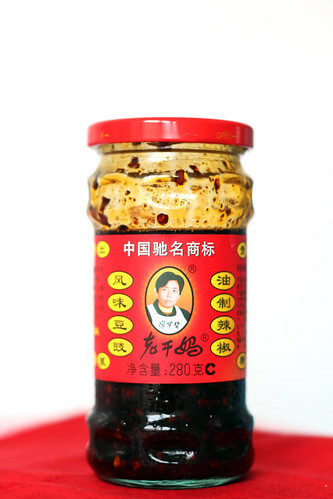 **If you can find Lao Gan Ma brand in the Asian aisle or at an Asian grocery store, use that! Or look for a chili oil that has chilies in the oil. Bring a pot of water to a rolling boil. Add the noodles and cook for 3-4 minutes, stirring occasionally*. While the noodles are cooking, prepare a cold water bath. When the noodles are cooked to al dente, drain and immediately place in the cold water bath. Let sit for 2 minutes then drain again and place in a large bowl. Toss with 1 tablespoon of oil to prevent from sticking. Heat 1 tablespoon of oil in a small saucepan over medium-high heat. Add the garlic and peanuts and cook for just 30 seconds to 1 minutes, or until the garlic is fragrant (you’re not trying to cook the garlic, you’re just trying to take a little of the edge off). 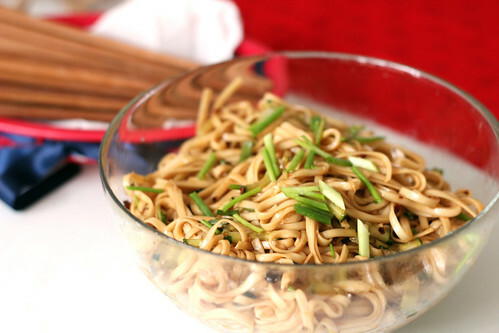 Immediately remove from heat and add, along with the cucumber and green onion, to the noodles. Set aside. In a small liquid measuring cup, combine the soy sauce, vinegar, chili oil, sesame oil, and sugar. If you like a lot of spice, add more chili sauce or a pinch of dry red pepper flakes. 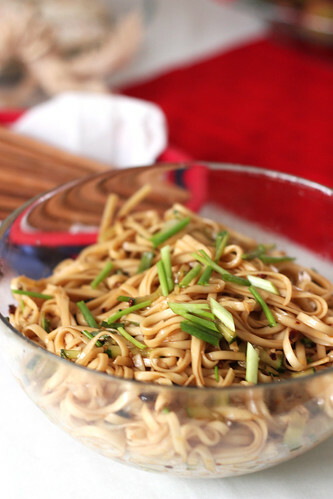 Pour over the noodles and toss to combine and evenly coat noodles. Can be served immediately or chilled in the fridge for 30 minutes. *These noodles cook much faster than Italian style noodles. Keep an eye on them so they don’t turn to mush! Things are moving right along for us here in China. Looks like we are in it for the long haul now, this weekend we even got the key to our new home, an apartment just a few kilometers away from the hotel. It’s great that we will have a comfortable place to call home, but the most exciting part (for me) is having my own kitchen, with an oven to boot (most Chinese kitchens do not have ovens, we had to specially request one to be put in)! Getting to go shopping for the necessary home goods is pretty fun, too. This past weekend we even made a trip to Shanghai to shop at Ikea. I love Ikea (probably too much). Aside from the business with the apartment this weekend, we also celebrated St.Patrick’s the Chinese way! Having spent a really good chunk of my life both doing and teaching Irish dancing, St.Patrick’s day is pretty important to me, so I was very excited to find a local *Irish* band performing at the hotel bar on Friday and Saturday evening! Anyway, here a few of my favorite Instagram pictures from the week! The new kitchen! It’s a little small, but it will do the job! I’ll post more pictures when I have it fully stocked! There is a small Italian restaurant near the hotel and they had a band one night. Their playlist included “When the Saint’s Go Marching In” and “Rudpolph the Rednose Reindeer”. Friday night pre-St.Patrick’s day celebration at the hotel bar. Saturday evening St.Patrick’s day celebration. Even in China, everyone is Irish on St.Patrick’s day! This statue was sitting next to me at dinner the other night. I just had to snap a picture. I think this might be one of the most gorgeously colorful dishes I’ve had here. Bright purple eggplant, bright red peppers, bright green green beans. And absolutely delicious. One of my most favorite dishes ever. Friday we went to KTV. Kind of like super karaoke. You rent a private room and it has a bunch of comfy couches, a tv, the computer with a HUGE selection of songs (English and Chinese), microphones, led lights… It’s quite the experience. In other new, we will be moving into an apartment in the next week or so! You know what that means, the kitchen will be open! So excited to get back into it. It also means I get to go shopping for some kitchen necessities, I love kitchen shopping! Hopefully I will be able to get back to posting more than one recipe a week! In the meantime I think I’ll be sharing something sweet this week. Check back on Friday for some DIY chocolate goodness! I’m a little late for this week’s Instagram post but I have a good excuse! On Sunday I had to put up a different post, for my friend Krystal’s virtual baby shower! Better late than never, here are my favorite photos from this past week. We spent most of the week in Hong Kong and that was an absolutely incredible experience!! The food, the city, the sites…. I love Hong Kong! This week I was skyping with my family, Biggie included!! About to hop on a flight to Hong Kong! The amount of people in Hong Kong is just unbelievable. People everywhere! We took the subway to Disney, and the last subway train was totally decked out for Disney! Loved the Mickey hand rings! While we were in Hong Kong we traded in my old camera upgraded to a T3i! Now I can take video! Can’t wait to take more food photos! Last night in Hong Kong. We had a credit at the hotel to use so we grabbed a drink in the lobby lounge. This was the view from the couch. Like I said, I love Hong Kong!